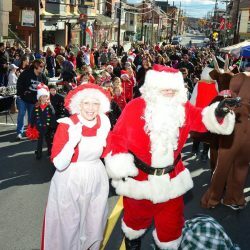 Join Building A Better Boyertown for Santa’s arrival for Chillin’ on Main scheduled on Saturday December 2, from 11am to 2pm, for a day of family activities right on Philadelphia Avenue, Boyertown. Philadelphia Avenue will be closed from Reading Avenue to Washington Street from 10 am until 3 pm. Santa and friends will be arriving on East Philadelphia Avenue at 11 am. Listen for the train whistle and watch as Santa arrives from the North Pole via the Colebrookdale Railroad to be dropped off right on East Philadelphia Avenue. Be sure to come early to get in line for your visit with Santa and receive a free 4” x 6” color photograph provided by TAYPAC Photography. Don’t miss Santa’s workshop, games, crafts, and activities provided by participating local businesses and non-profits on your favorite Main Street. Mack Party Pros will be rocking around the Christmas Tree with holiday music and announcements during the event. The Boyertown Community Library will have reindeer food, The Salvation Army will provide hot chocolate, and lots of cookies to be handed out by the volunteers of Building A Better Boyertown.